In three weeks of eating a diet that was devised by scientists to sustain a planet with 10 billion humans, I’ve learned about my own relationship with food and the ups and downs of eating in 2050. This week, I looked in my fridge and realised there’s one thing I’ve really been struggling with. Pushing aside the spinach, I gazed in shame at leftovers packed with the best of intentions but left to slowly wilt and transform inside mason jars and various other containers. I looked at the vegan nacho cheese (which you have to make even if you scoff at vegan anything) I was getting ready to add to the menagerie, and wondered if it would meet the same mouldy fate. While eating what has been dubbed a planetary health plate diet has kept me focused on what’s on the plate, it’s also put the food that goes in the trash in sharp relief. There have been attempts to address parts of the food waste issue, from delivery services that send you ugly produce farmers would (in theory) otherwise throw out to compost programmes. But as Emily Atkin found for the New Republic, the former has proven a bit problematic. While the latter diverts waste from landfills where it can produce methane and instead puts it to good use, a better use would be getting that food to people who need it. Less food wasted would translate to farmers growing less, reducing the need for water, land, and nutrients. In a brief on the EAT-Lancet report, the commission behind it suggests packing up leftovers for lunch, or finding creative uses for them. I’ve been doing the former, but my creative use of turning the back of my fridge into a science experiment probably isn’t what the report authors had in mind. 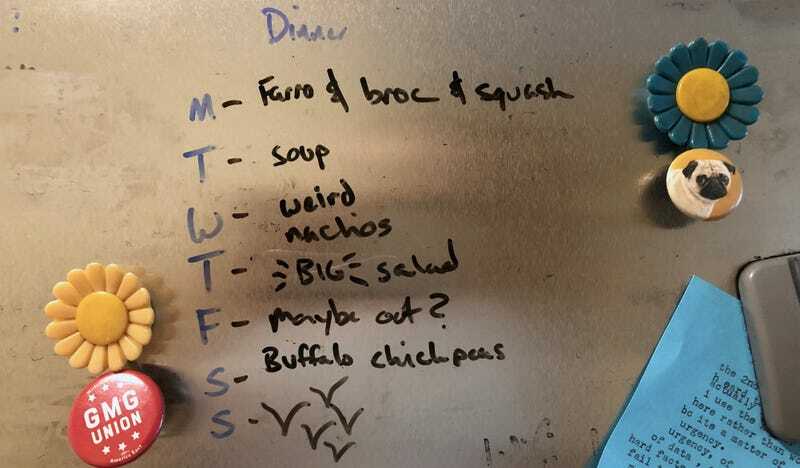 The brief also suggests making a meal plan, which I usually do when I’m not feeling lazy (see Exhibit A below). But after making “weird nachos,” which involved the aforementioned vegan cheese, sweet potatoes and cauliflower, I was left with this troublesome amount of sweet potato queso. It was too little for a future rendition of nachos but too much to justify tossing out. In fact, I realised that was the case with almost all my leftovers. Here was the handful of lentils I swore I would add to a salad at some point, there was the speck of hummus I thought maybe I could make the base of a salad dressing. I’ve always been a bit of a leftover hater. But the planetary health plate has ironically kicked it into overdrive, since I’ve been making whole grains in bulk and buying more perishable produce to keep up with the diet. I don’t really have any snappy ideas for how to fix this, aside from eating my goddamn leftovers. But the problem did get me thinking that we don’t devote nearly enough energy to talking about what is easily the lowest hanging fruit in the sustainable diet arsenal, one that doesn’t raise hackles like talking about eating less meat, for instance. Nobody likes that dreaded Sunday when it’s time to clean the fridge out; shovelling mouldy leftovers and chucking the dregs of spoiled half and half without opening the carton into the trash. It’s a terrible chore that basically amounts to throwing money and the planet into the garbage. Now that I’m a bit more aware of the problem, I’m going to do my best to make sure the back of my fridge is no longer a wasteland of failed dreams. Speaking of, hit me up if you’ve got ideas for how to use that vegan cheese.